You have so much power, and you are using it in all the wrong ways. To those of you disrespecting the men and women who risk their lives daily, I have four words for you: Stand the hell up! People have died to protect your freedom, and the least you could do is show them the respect they deserve. I understand that everyone has the right to speak freely. I recognize that our country is having some problems and that you are trying to drive change. However, is this really the way you want to do it? Recently, the Beaumont Bulls, a youth football team in Beaumont, Texas, protested the national anthem by taking a knee while the song played before the start of their game. The boys are around 10 years old. Was this your goal? Did you set out to teach elementary school children to disrespect our Armed Forces? I know you believe it is not disrespectful, but I strongly disagree. This song represents everything beautiful about our country. The anthem honors the men and women of all races that serve our country. I am not ignorant to the recent violence throughout the United States, nor do I think it should be ignored. However, this violence doesn’t negate the courageous work our military does, and it certainly doesn’t negate the loved ones lost protecting your freedom. Additionally, for those of you who chose to kneel on September 11th, that conduct is repulsive. Nearly 3,000 people died on that terrible day. All across the world, our service men and women fight to protect our country so that an attack of that magnitude can never happen again. I don’t know why you thought it was appropriate to kneel on September 11th, but it was not. Our nation’s anthem honors the men and women that risk their lives every single day for you. By choosing to sit or kneel while it’s playing, you are disrespecting our military and the work they do. Please be conscious of the fact that you are role models, and children look up to you. You have so much power, and you are using it in all the wrong ways. Every time a member of the Armed Forces dies, that is someone’s sibling, child, parent, spouse, or friend. How would you feel if your loved one died fighting for this country, and someone made a decision to disrespect his or her life intentionally? These people are real heroes. They leave their families for months at a time, and they miss out on holidays and various family milestones. They make constant, daily sacrifices for their country. 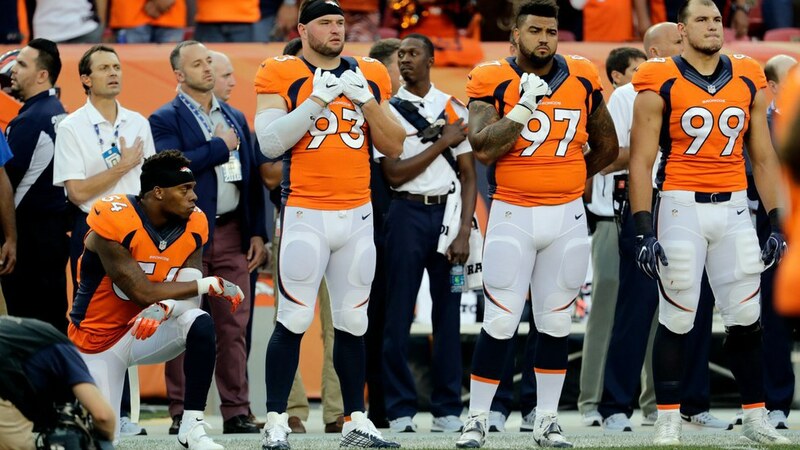 When they don’t agree with something, they don’t just take a knee; instead, they continue to do their job, and they don’t get paid millions for it either. So next time when the national anthem plays, please stand and spend two minutes thinking about the men and women that serve this country. Please remember that you’re able to make a living playing the sport you love because of our Armed Forces and the work they do.